SolBridge Student Council is an organization lead by students for students. As the chosen student leaders of the school, Student Council works with the school management and administration board, staff members, student body, and local community to represent the concerns and opinions of the student body for the benefit of the school, students, and community. It works to enhance student life, build school spirit and pride, strengthen the overall school and contribute to charitable causes and the community. In addition, Student Council members are in charge of the planning and organizing of many educational and recreational events. These student ambassadors are also responsible for the 18 clubs. They strive to create both a fun and memorable school year and to ultimately pass a legacy for future councils to build upon. Student Council also participates in developing the university’s educational projects, such as anti-bullying policy, anti-cheating campaign, recycling and green living, etc. It promotes and encourages the involvement of as many students as possible in the school activities to improve the quality of life in SolBridge. Associates Recruitment: the associate team is formed in order to help the Student Council run its events smoothly. Associates are recruited in the beginning of the Spring and Fall semesters with varied number of students recruited each time. All SolBridge students are eligible to apply, including transfer and exchange students. Excursions: students have the opportunity to go to various places or festivals around Korea. There are approximately 4-6 destinations each semester. Club Expo: organized to give students a chance to get to know, and at the same time be a member of the clubs that they are interested in. SolBridge Jacket / Hoodies Sign Up: a chance to show our unity as a SolBridgers. Official Jacket and Hoodie are sold once every semester. Exam Week Surprise: to boost up students’ energy during midterm and final week, we wish student good luck by giving away something special for students. Woosong Sports Day: usually held for two days during the Spring semester. All departments of Woosong University will compete in various competitions. Movie Night: students can enjoy a movie together with their friends as a way to relief stress after the midterm exam week. Garage Sale: students have the opportunity to sell and buy things face-to-face by the end of each semester. SolBridge Festival: students can share their culture through traditional food, games and performances. Culture Day: a tradition since SolBridge first opened its doors to more than 30 nationalities around the globe. Held on every Fall semester, this event consist of two parts: food festival and cultural performance. Commencement Eve Celebration: celebrated at the end of every Spring and Fall semester, this event is the most luxurious events. All students are welcomed to join to celebrate and send farewells to the graduates. 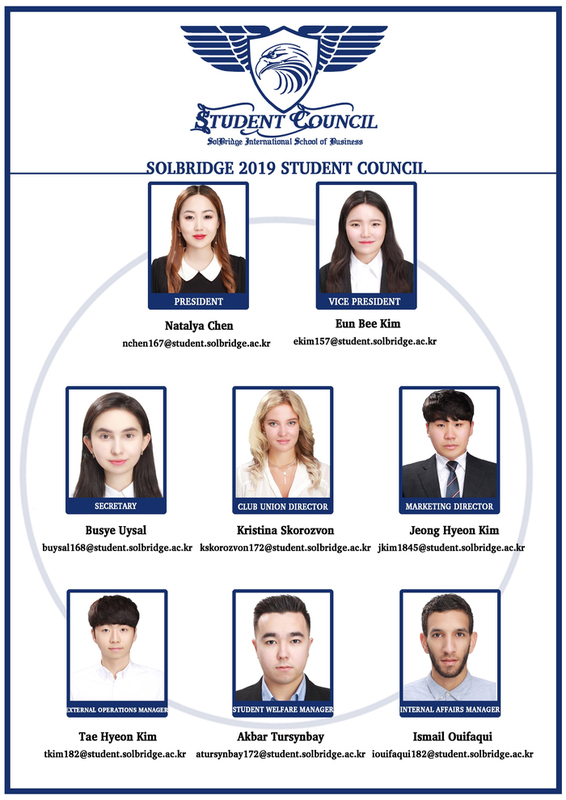 SolBridge 11th Student Council consists of 8 members from different countries, who bring ideas, requests, and feedback to the meetings as a representative from each country. They communicate and consult with all of the students in the school to identify and help solve problems encountered by students in the school. This democratic process is used to give other students with different backgrounds and cultures an opportunity to voice their opinion. This way, the Student Council is able to officially represent all the students in SolBridge.